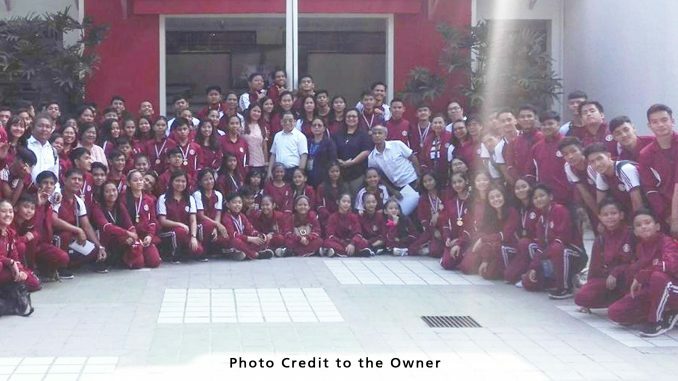 The 34 athletes from Public and Special Schools in Pasay City qualified for the Palarong Pambansa to be held on April 27-May 1 2019 in Davao City. The qualifiers rose from the rank of the pool of athletes from the 16 divisions who participated in the Palarong Pangrehiyon held in Marikina on February 24-March 1, 2019. SDO Pasay garnered 72 golds,33 silver and 61 bronze in various sports categories. In the overall standing results, Elementary Level ranked 11th place while the Secondary level was proclaimed the 8th placer. The athletes from Special Schools (Cluster 5) who competed in Paralympics were declared as Overall Champion. The Paragames Goal Ball athletics, Swimming, Volley Ball and Chess is said to be one of the contributory factors for the said championship since Pasay City is the Overall Champions in the previous years’ Palarong Pangrehiyon. Genelle P. Macaspac a grade school pupil in Villamor Air Base Elementary School is the sole representative in swimming in the Palarong Pambansa. Other schools who grabbed the gold awards with the following categories are: Timoteo Paez Elementary School in gymnastics and Villamor Air Base in Arnis Boys/Girls. Meanwhile in the Secondary Level Overall Champions who will represent Pasay City are: Pasay City North High School-Tramo in Wushu Sanda Boys and Girls trained by Rona Marie Obo and Yolanda Razonable, Kalayaan National High School in Boxing with Mary Jo F. Reyes as coach. Pasay City South High School Basketball 3×3Boys coach is Romarate Weian Clar, Arnis Boys athlete is Joeh Marie Thadeous Sanda Girls coach Yolly Razonable. Pasay City South High School has contributed 8 gold medals in the Secondary level. The Pasay City West High School and President Corazon C. Aquino National High School are gold awardees in Pancake Silat Girls. The Paragames was dominated by the School for the Blind. The expertise of the following trainers lead to the championship: Goal Ball trainer Lanie C. Lebuna, Swimming Visually Impaired. Athletics Boys gold award Girls, P. Villanueva Elementary School SPED Center, Swimming Boys gold Rodrigo T. Ravanera, Swimming Girls: Kris Ann S. Baroza Coach: Evelyn Reynaldo and trainer Reynante Panlaqui. During the flag ceremony on March 11,2019 the athletes were given due recognition. In her message, Dr. Evangeline P. Ladines expressed mutual understanding of gratitude to the athletes, coaches, coordinators, medical group, school heads and SDO officials who exerted efforts for this victorious quest. She urged the athletes saying, “At the moment savour the victory but don’t settle for your accomplishments because it is tasteful to be on top. She further stated her gratitude to the Local School Board for the provision of food, uniforms and transportation of the delegates in the Palarong Pangrehiyon and Palarong Pambansa. She ended her message asking the athletes to persevere in order to win in the Palarong Pambansa. She concluded with the commendations for their full support to the Sports Development Program of the Division.